This book was simply amazing, it is the third in a series with Detective Superintendent Roy Grace as the main hero. This author has published a further (non-crime) 14 books apart from the Grace series. Katie Bishop, the wife of one of Brighton's most prestigious businessmen is murdered in a very savage manner in her Brighton home which she shares with her husband Brian. He has another home in London where he does most of his business and he was there when she was killed. Grace is immediately suspicious of the husband of the deceased particularly when he discovers that there was a huge life insurance policy on Katie with the husband as sole beneficiary. The husband is discovered successfully playing golf in Brighton in a tournament on the morning after the killing. He was having dinner and drinks in a restaurant in London, on the previous evening and couldn't have driven to Brighton immediately afterwards, killed his wife and then gone on to play golf the next day... or could he? This very entertaining, multi-layered, novel continues in a very riveting fashion and the pages just speed by. There are numerous sub plots, one being about the wife who disappeared from Grace's life nine years previously but who is supposedly spotted in a Munich cafe by a mutual friend, forcing Grace to go to the German city to check this out. Then there is the on-off relationship Roy is having with the Chief Mortician Cleo Morey. Additionally, Grace's assistant, a Detective Sergeant Glenn Branson has been kicked out of his own domestic environment by his wife and Grace lets him stay with him but cannot stand the man's disorganised, slovenly ways which cause a lot of resentment. All in all, I was very entertained by this novel which is the first I have read by this author and as it was almost impossible to put down, I shot through it in about two days. I will definitely look out for more of these "Roy Grace" stories in the future. 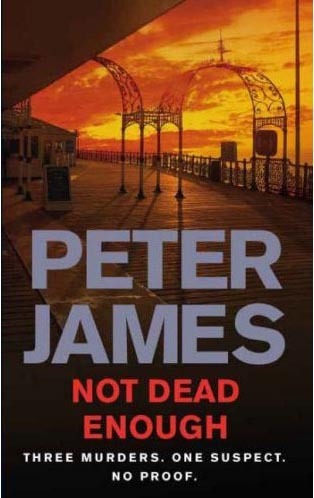 Read another review of NOT DEAD ENOUGH.